From pristine sand dune beaches to world-class restaurants, there is more than enough in Saugatuck to keep you occupied for the duration of your stay. But sometimes you need a vacation from your vacation. Luckily, there are many great and easy day trip options located all throughout the region. Here are 5 of our favorites. Holland has been named one of the prettiest towns in America by Forbes. Downtown Holland has also repeatedly won the “Great American Main Street” award. If that doesn’t convince you, then Holland’s small town charm and unbeatable Dutch cultural offerings will. Located just twenty minutes from Saugatuck, Holland is the best place to go for all things Dutch. While you’re there, you can tour the Nelis’ Dutch Village, vist the Windmill Island Gardens, learn about Dutch art and culture at the Holland Museum, and sample a delicious variety of Dutch delicacies served in the local shops and eateries. If you visit in the spring, be sure to pay a visit to the Veldheer Tulip Farms to marvel at tulips in every color of the rainbow. Holland also hosts the Tulip Time Festival and Dutch Winterfest, two of our favorite local events. Beyond Dutch culture, Holland boasts lovely wooded areas, gorgeous sand dune parks, award winning breweries, and the bright red Holland Harbour Lighthouse. South Haven is all you could want from a lakeside Michigan town: pristine beaches, scenic nature preserves, great art galleries, and unbeatable food and drink options. Head to the Michigan Maritime Museum to learn more about the rich maritime history of the region. You can even experience some living history aboard by setting sail on the Friends Good Will, a historic replica of a tall ship that first set sail in 1811. We also recommend paying a visit to South Haven’s historic lighthouse, taking a walk through the Portman Nature Preserve, and touring the many world-class breweries and wineries located downtown. Douglas, also known as the City of the Village of Douglas, is Saugatuck’s neighbor, and we strongly recommend you take time during your stay to pay it a visit. Once you’ve hit all the art galleries in Saugatuck, head on over to Douglas, where you’ll find great options like the Water Street Gallery, J. Petter Galleries, and Button Gallery. Douglas also has great restaurants like the Farmhouse Deli & Pantry, Everyday People Cafe, and Wild Dog Grille. Combine galleries and lunch with a stroll down their charming mainstream for the perfect afternoon. The Ross Coastal Plain Marsh Preserve is home to 1,500 acres of coastal plain marshes, wet meadows, sand dunes, wooden inland dunes, wetlands, small lakes, and northern hardwood forests. Coastal plain marshes are most common in the Atlantic and Gulf coasts, making this preserve particularly unique in the region. Out of the 42 identified coastal plain marshes in Michigan, this preserve boasts three of the highest quality. If you like to hike, there are 5 miles of trails throughout the preserve. The preserve is also a great spot for wildlife watchers. Keep an eye out for reptiles, amphibians, red foxes, coyotes, and over 100 species of birds. This gorgeous preserve is located just 35 minutes away from Saugatuck. Kalamazoo is located one hour away, but it is well worth the trip. Some of the best museums in the state are located in Kalamazoo, including the Air Zoo Aerospace and Science Museum, which features 50 rare and historic aircraft and a variety of rides and flight simulators, and the Gilmore Car Museum, which houses one of Michigan’s largest collections of classic and vintage automobiles. The Kalamazoo Nature Center expands across 1,100 acres, with an 11-acre arboretum, 11 nature trails for hiking or cross country skiing, state-of-the-art interactive exhibits, a three-story tropical rainforest, a Bug House, and seasonal butterfly and hummingbird gardens. Kalamazoo is also home to the first outdoor mall in America and Michigan’s oldest craft brewery. Downtown, you’ll find excellent restaurants, nightclubs, and shopping options. 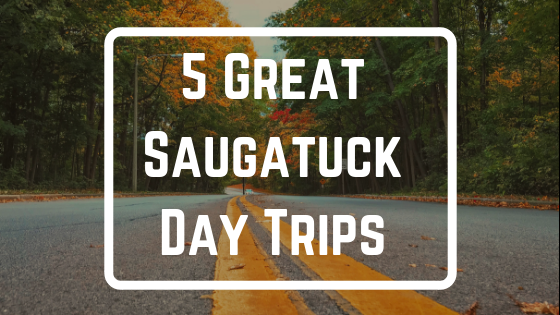 Planning a trip to Saugatuck, Michigan? Book a stay at the charming Twin Oaks Bed & Breakfast, located just steps away from restaurants, shops, and the marina.